The days leading up to the release of X-Men: The Last Stand have had fans completely polarized across the globe. There are those that spell doom for the franchise with After the Sunset director Brett Ratner taking over for the brilliant Bryan Singer, and then there are those for whom Hugh Jackman and his pals can do no wrong. Surprisingly both sides side of the argument have proved to be correct and wrong at the same time. Let us explain. X-Men: The Last Stand is a film that shows frequent glimmers of quality story-telling and craft, only to smother all opportunity to rise to greatness at not-too-infrequent intervals at the same time. In combining two epic, sweeping comic-book stories from the X-Men canon - the resurrection of Jean Grey as a powerful, crazy being known as Phoenix, and the recent successful Mutant Cure saga helmed by Joss Whedon - the film compromises on character moments and sufficient time for the actors to establish their motivations. So, where the film delivers in punches is its choice of subject matter. The mutant cure plot is a great one because it throws into stark relief the myriad sub-groups that had formed due to necessity and fear of persecution. Suddenly old loyalties don't matter anymore, as you don't need to be different anymore. What gives it even more brevity is the film's adamant refusal to paint black-and-white pictures with its storyline. Billionaire Warren Worthington II simply wants to cure his son's angelic wings, so he creates a cure, which he really believes is helping the mutants. Magneto (Ian McKellan) and his Brotherhood perceive this cure as a threat - an act by a beleaguered government to eradicate the mutant gene pool. Meanwhile, Charles Xavier (Patrick Stewart) and his students face a personal tragedy, and have to contend with the resurrection of thought-to-be-dead Jean Grey (Famke Janssen) in an evil avatar. Magneto decides to use the power of the Dark Phoenix residing inside Jean to eradicate the cure threat once and for all. When one of a bunch of under-arrest mutants gets de-mutated by a weaponized version of the cure, Henry McCoy, aka the Beast, and the Secretary of Mutant Affairs, is outraged, and decides to join Charlie Xavier's team. Magneto frees Juggernaut and Multiple Man. Warren Worthington III flies away, wings and all, to the Xavier academy. And so on and so forth. After a while you start getting the feeling that instead of cool characters to invest your screen time in, these new additions function as the equivalent of bond gadgets - dispensable, and only there to help the main characters sort something out. This gets to the point where some of the main characters in the film struggle to make their presence felt. There is some top-notch acting by Jackman, Berry, Janssen, and, of course, veterans like Stewart and McKellan, all of them reprising their roles with gleeful enthusiasm and giving underscored performances in whatever screen time they get. But it's a 97-minute action blockbuster, and character development is the least of its worries. Apart from one helluva plot and some exemplary acting, the best thing going for the film is its action set pieces. Fans have been wary of Brett Ratner's penchant for confused and cheap-shot action thrills in his previous films, and expected this film to not match the bravura of Bryan Singer's vision. They needn't have worried. Ratner serves up action set pieces that range from truly astonishing to serviceable, and restrains himself to the tone and color of the previous films. CGI, animatronics and other standard tools of the trade are utilized amply to provide some true moments of cinematic whiz bang, and you have to thanks your "stars and garters" for the non-stop action-comic feel of the film. The Last Stand is a successful attempt at a comic book popcorn fare, piggy-backing on the previous films' character development, and some deadly good performances from actors who can now play these parts half-asleep. It's a good action blockbuster which remains steadfast to the tones of the predecessor, but is far from the final chapter that this beloved franchise deserved. X-Men fans will undoubtedly be pleased with some long deserved fan service moments (Storm flies! ), but they might feel justifiably angry at the cavalier way in which some major characters are removed in the course of the film. In the end, the only fault that the film has, really, is the fact that it is terribly unambitious in its execution. On the other hand, it has some fun moments and does the job well. If you always thought this film would underachieve, knock off a point from the rating above, or if you really wanted a fun action comic-book film to watch, add a another point to the rating. 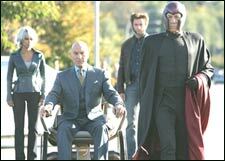 Either way, this remains an important milestone in the X-man movie franchise, and you should watch it. Just don't expect too much. PS: Wait till the credits have ended for a short but important coda for one of the most important characters in the mythos. For fans of the franchise, it will serve as a surprisingly pleasant wink of the eye. Be the first to comment on X-Men 3 (Hindi)! Just use the simple form below. fullhyd.com has 700,000+ monthly visits. Tell Hyderabad what you feel about X-Men 3 (Hindi)!